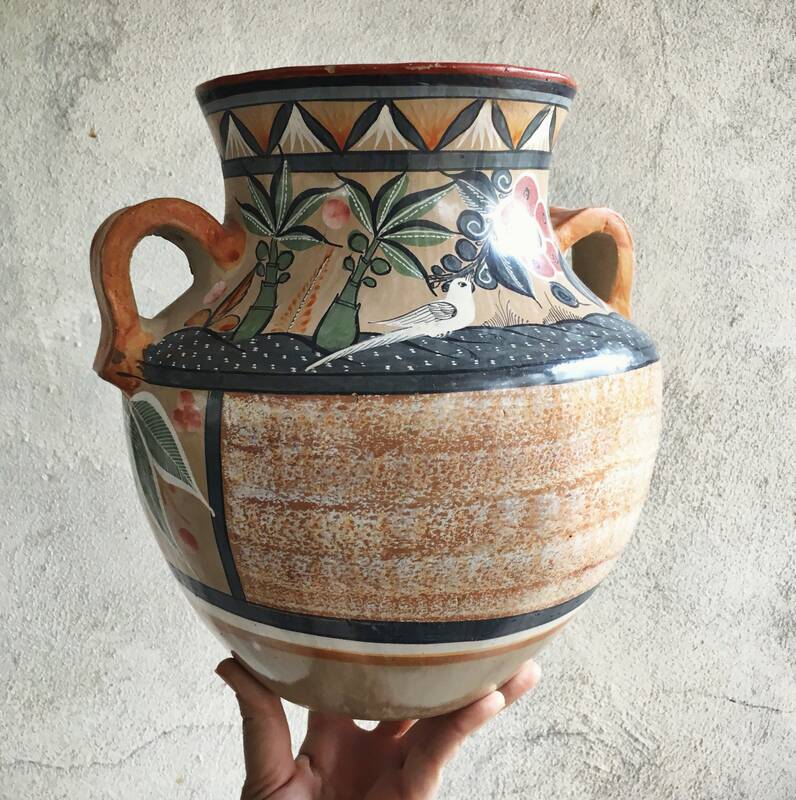 Here we have a quite large and heavy pottery olla or pot with handles, from Tonala, Mexico, in the style of master pottery Amado Galvan. 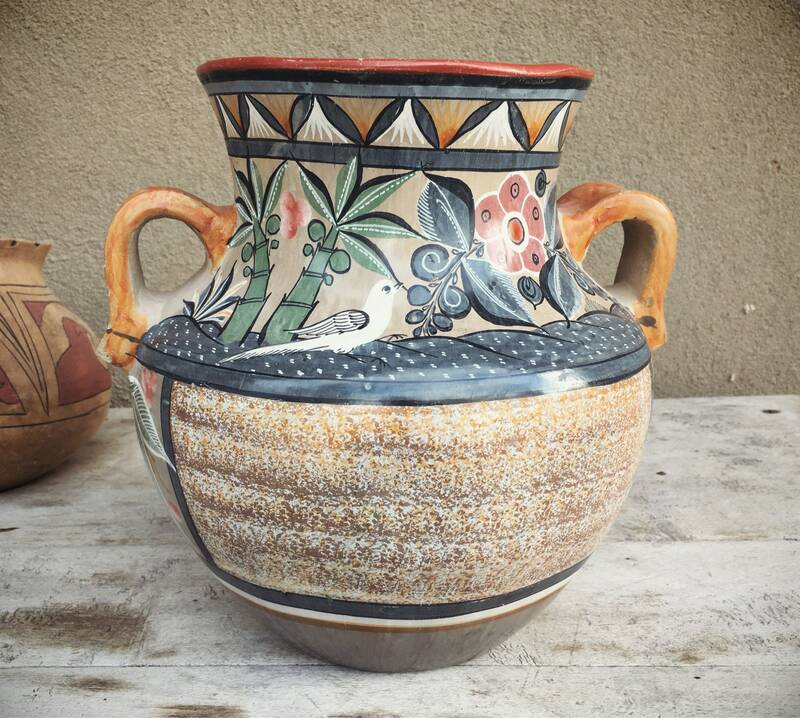 Called "barro bruñido," or burnished pottery, which is a form that is not glazed but rather given a "slip and polish" with stone or pyrite. Like many of this style, this vase is painted with birds, flowers, and a sort of tree. 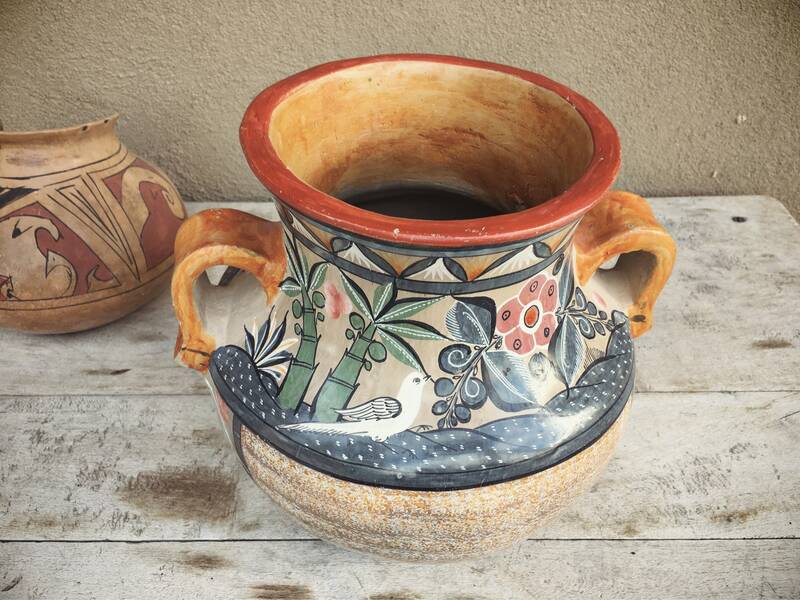 The theme of nature is common on Tonala burnished pottery, and the scene on this piece is delicate, intricate, and lovely. 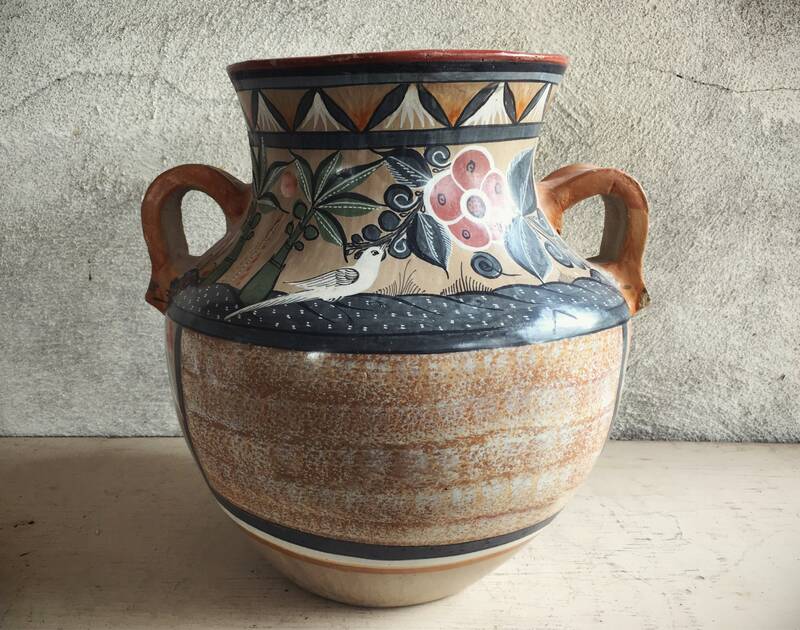 The overall color tone of the vase is a sort of taupe-beige with slate blue, white, and ochre among other colors. The vase is thick enough that it could possibly hold water, but generally these vases were produced as décor pieces versus actual vessels. 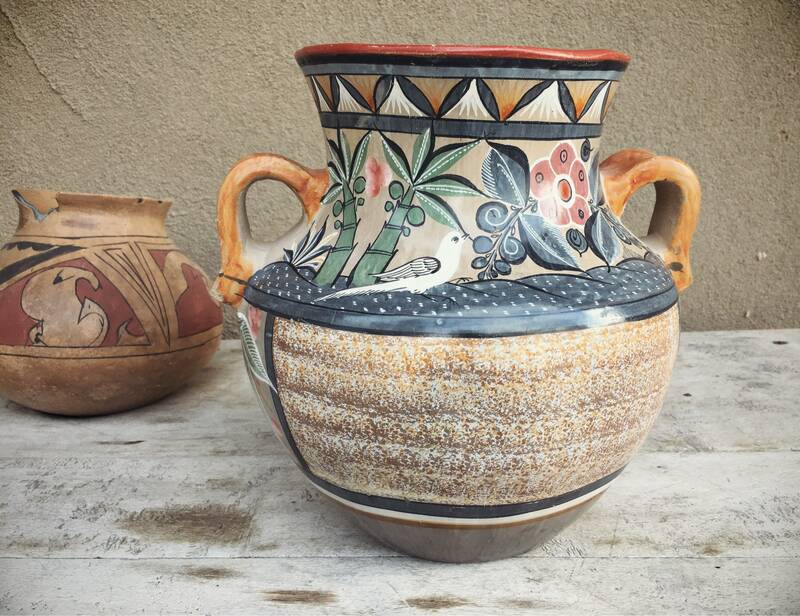 Sharing a border with Mexico, New Mexico has for decades been an importer of Mexican pottery and other goods, and many pieces that came here in the 1970s and 80s, in particular, were done by master potters yet unsigned. 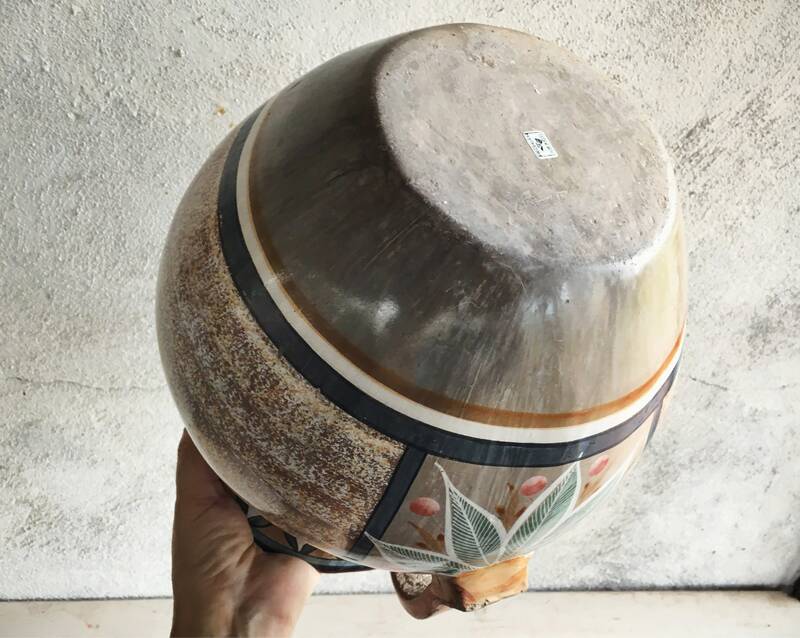 So while we cannot claim with certainty that this is a piece from a master pottery, we can say that it is definitely a stand out piece both for the size and the artistry. It would be gorgeous as a centerpiece on an entryway table or fireplace mantle. 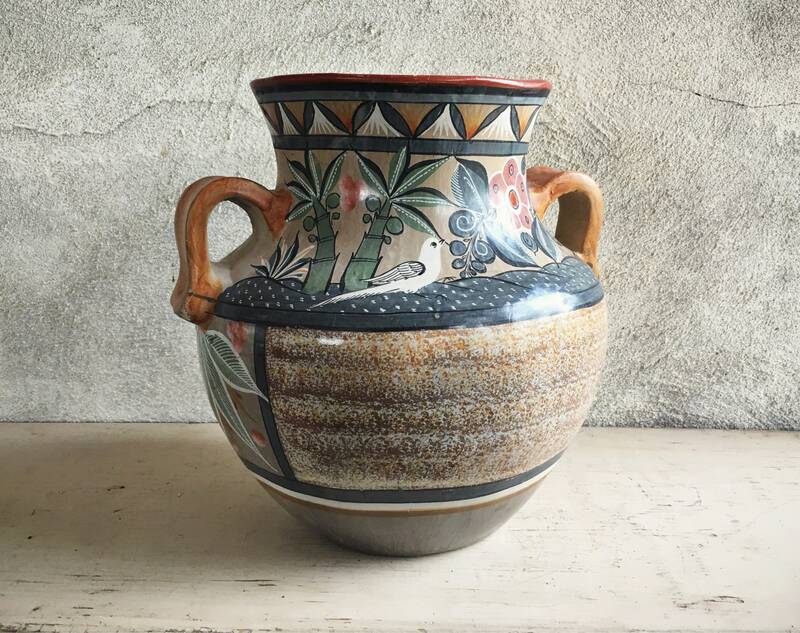 The vase measures 10-1/2" tall and about 10" across the handles, and a mouth of 6-1/2" in diameter. There are areas where the clay has worn down, as well as small chips, but no cracks nor large chips. In fairly good vintage condition overall. Weighs close to five pounds unpacked, and will be double boxed, which accounts for the high shipping cost. Truly a showcase piece of Mexican art and décor.